When you travel through the entirety of the USA, themes and patterns pretty much throw themselves at you. So yes, we could’ve written a post about all the towns in America that have miniature Statues Of Liberty, or noted the many variations on speed bumps across the country… but we wanted to put together a theme that would actually entice you to quit your job and grab your keys. 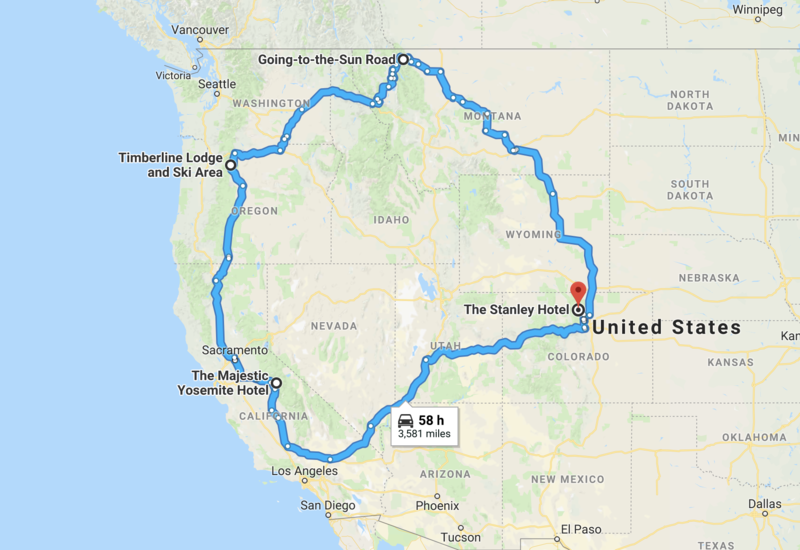 So, here it is: an unabridged tour of locations associated with everyone’s favorite hotel horror story, The Shining. 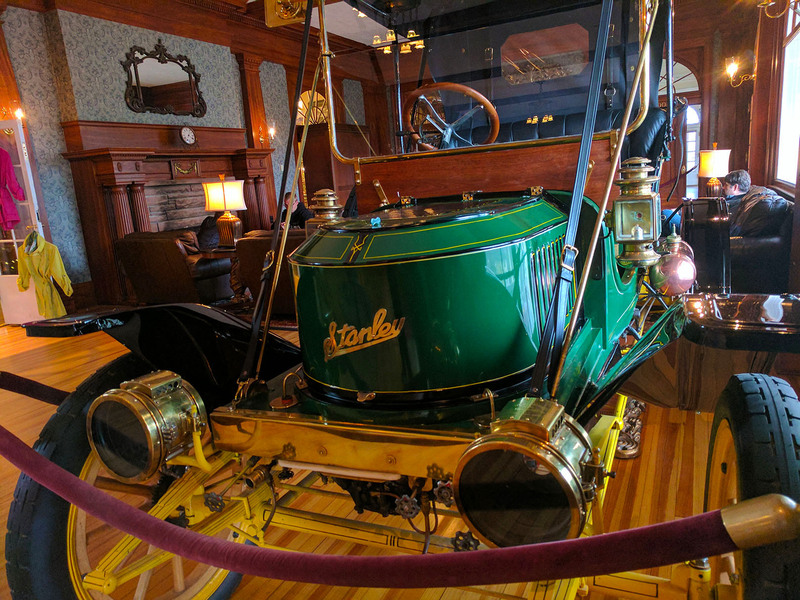 Estes Park is one of our favorite villages in the entire U.S., and perched atop it all sits the lovely Stanley Hotel. 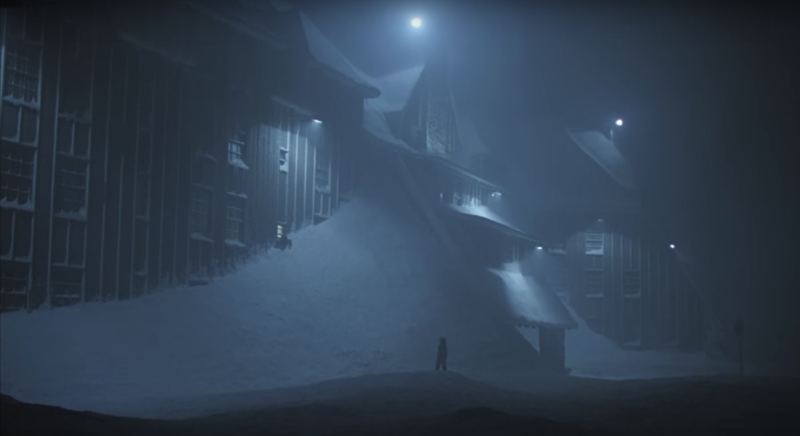 Stephen King once stayed in this hotel during a bitter snowstorm, and with few other guests around to break up the ominous isolation, he was inspired to pen The Shining. There’s your origin story. 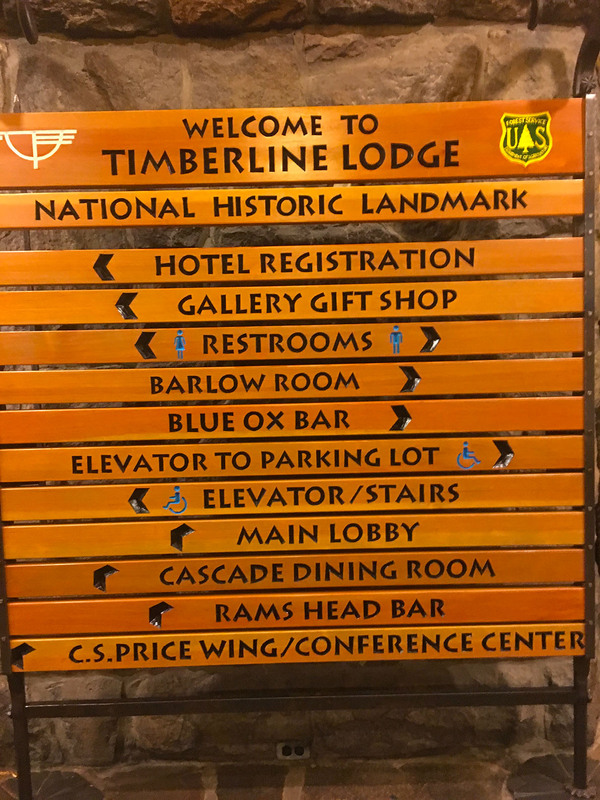 Nowadays, the hotel has revised its history a bit to claim hauntings and murders and all sorts of things that never existed before The Shining was published. 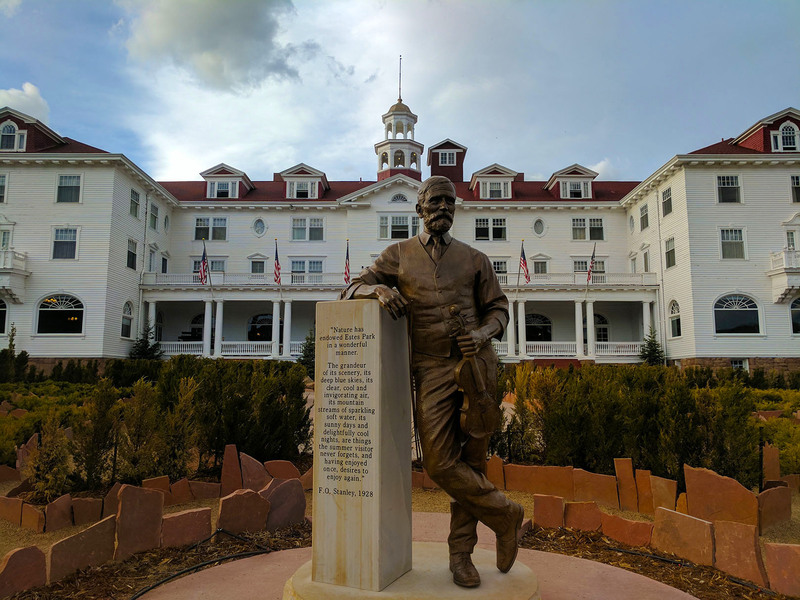 You can take a ghost tour, or check out some of the paraphernalia… which is odd, because at this point, the 1980 film is how most people know The Shining, and absolutely none of that was filmed here. What was filmed here was the very forgettable 1997 made-for-TV movie, which King personally had a hand in producing. Why shoot a low-budget remake of one of the greatest horror films of all time? It’s well known that King despised Stanley Kubrick’s 1980 adaptation of his book. 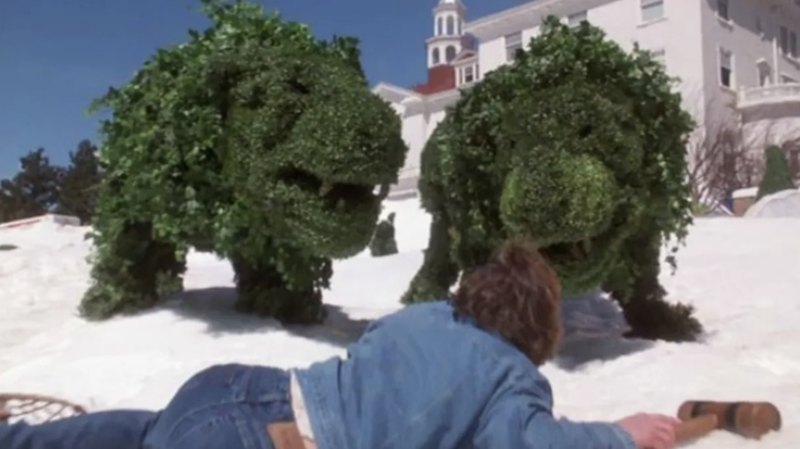 But you be the judge: here’s a still from that 1997 TV movie, where the topiaries turn into angry dinosaurs or something. And on that note: if you want to get an idea as to how openly this hotel embraces The Shining tourism mania, consider this: a few years back, they began planting a new hedge maze. However, The Stanley never had a hedge maze to begin with, and no such maze is brought up in King’s novel (just the topiaries, which hold little significance.) 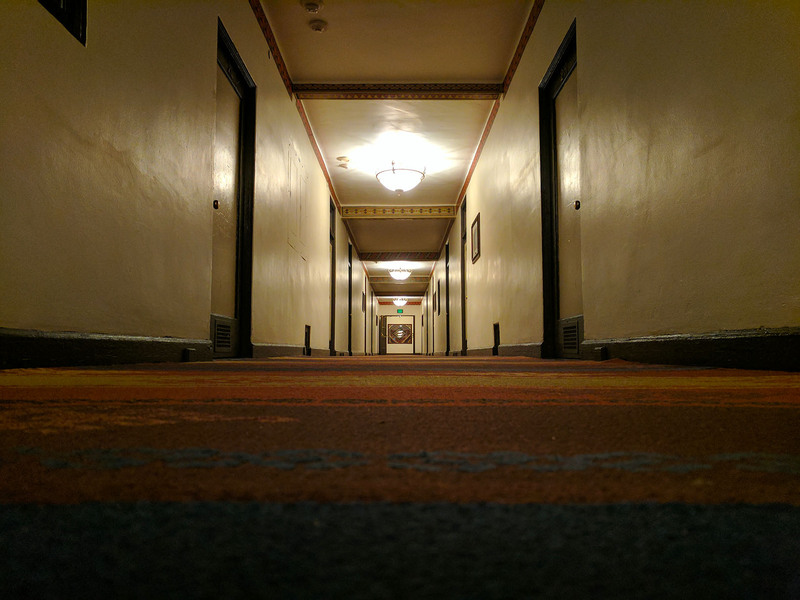 Effectively, this hotel is planting a maze to strengthen its spooky ties to The Shining franchise, even though the story’s original author never saw a maze here. 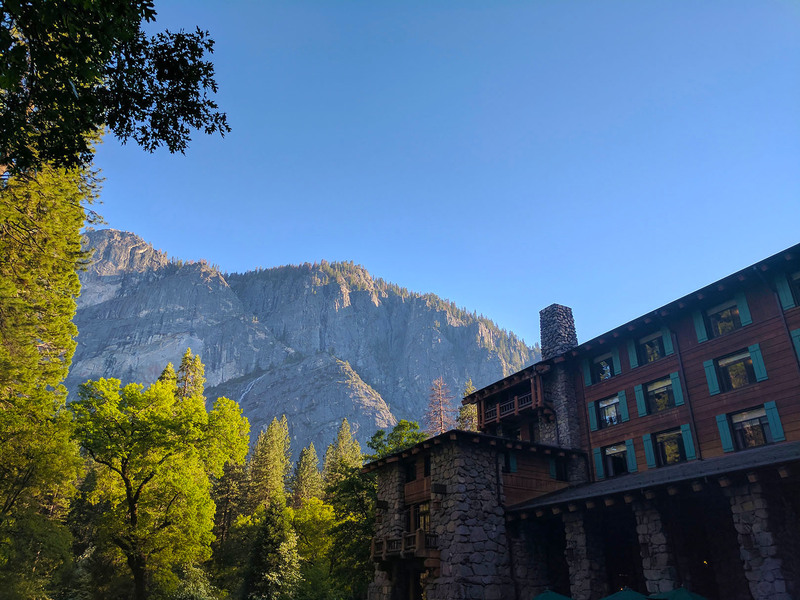 The Majestic Yosemite Hotel (originally known as and from here on referenced as the Ahwahnee Hotel) is one of two Shining Route locations situated smack in the middle of a National Park. The exterior probably doesn’t give you those nostalgic chills you were hoping for — but let’s walk inside and see if it doesn’t get your blood flowing. 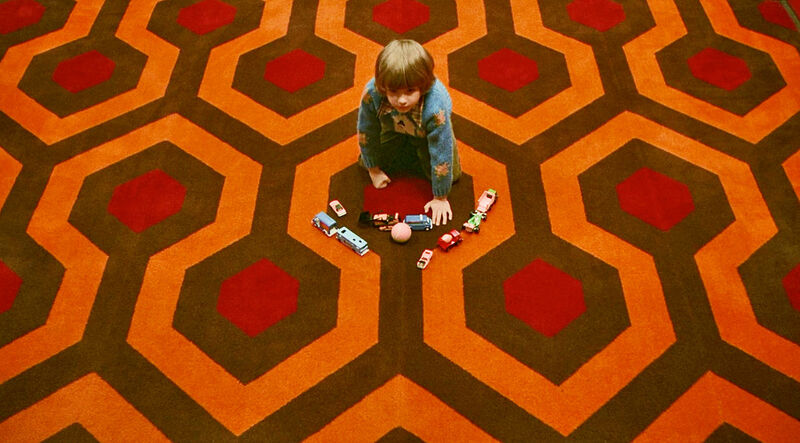 If you’re looking for Room 237 in this hotel, you won’t find it — we checked. 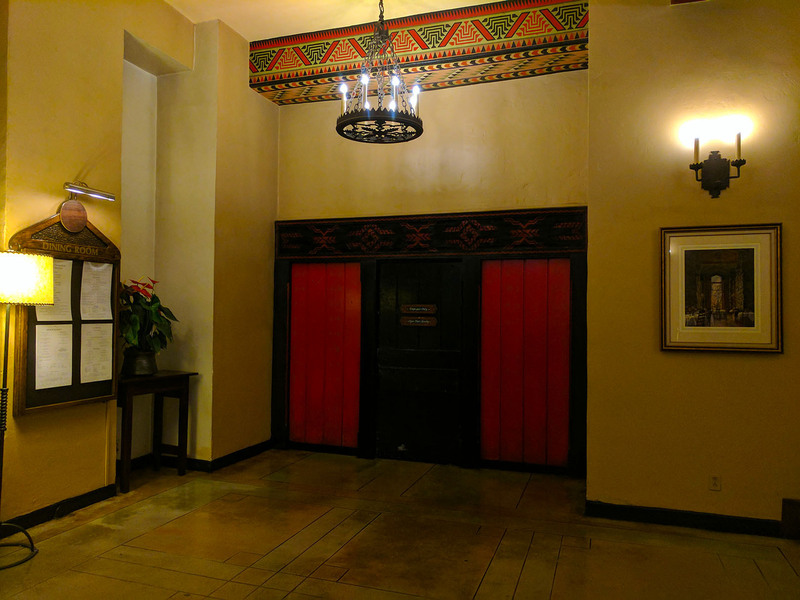 Hotel management begged Kubrick to change the haunted room number from its original 217 (in the novel) to a room that didn’t exist in the building. 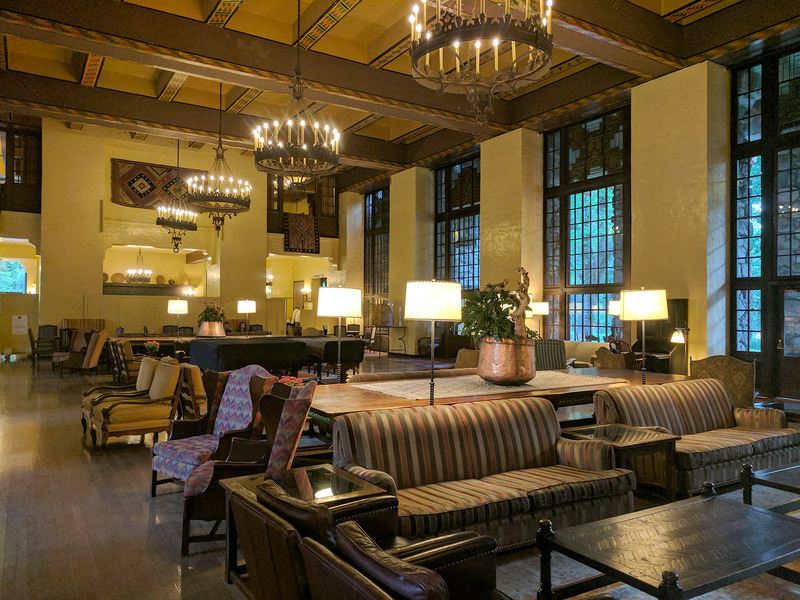 The Ahwahnee Hotel is probably the most intriguing stop on the Shining Route, not only because its vivid interiors make you feel like you’re on set with Jack Nicholson, but because you quickly learn something about The Shining from walking around this hotel. In reality, the famous 1980 film was shot almost entirely on a sound stage in England. 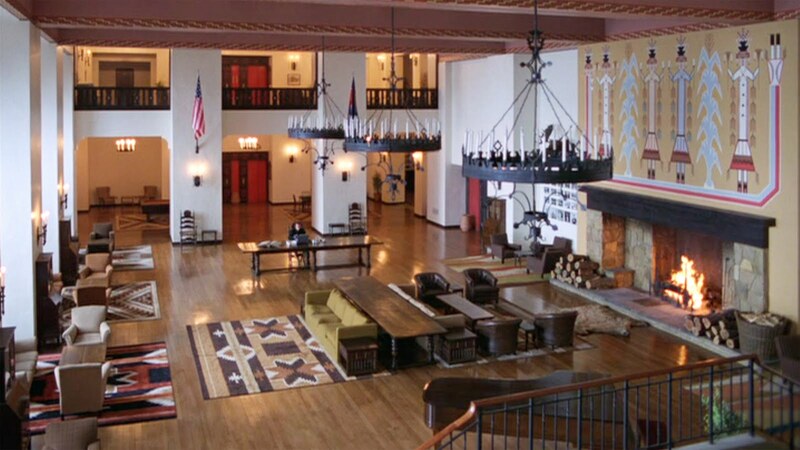 Nothing was shot on location at the Ahwahnee, but Stanley Kubrick was so enthralled with the hotel on a personal visit that he decided to model his movie set after it. Of course, in classic Kubrick fashion, he added some (literal) twists: scenes inside the hotel are designed to bewilder the audience, so many of the shots you see — such as Danny riding his trike through the halls — are physically impossible from an architectural perspective. One would hope this “bewildering” gimmick was also the reason for Kubrick’s choice of carpeting. 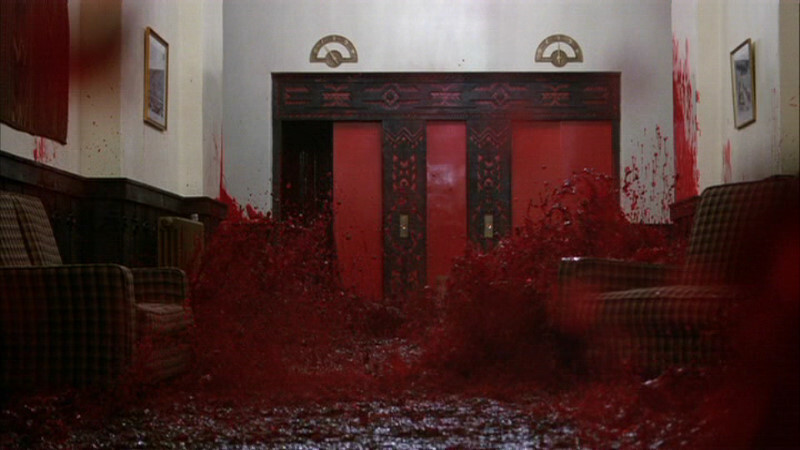 And of course, the red elevator doors. No, Scatman! Don’t walk down there! 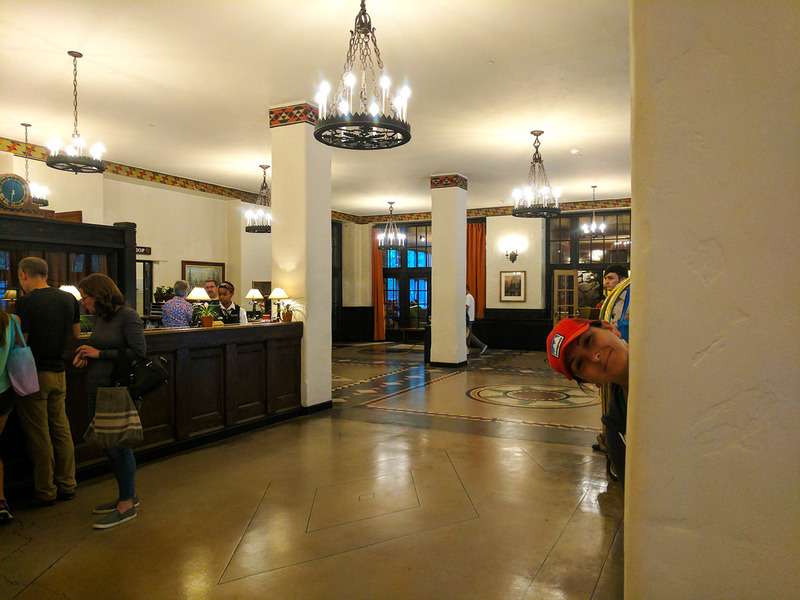 So, we’ve established that the Ahwahnee Hotel’s exterior was never a part of The Shining, and the Stanley Hotel had nothing to do with the Kubrick film. So then, what the heck is this place at the end of the movie’s opening title sequence? 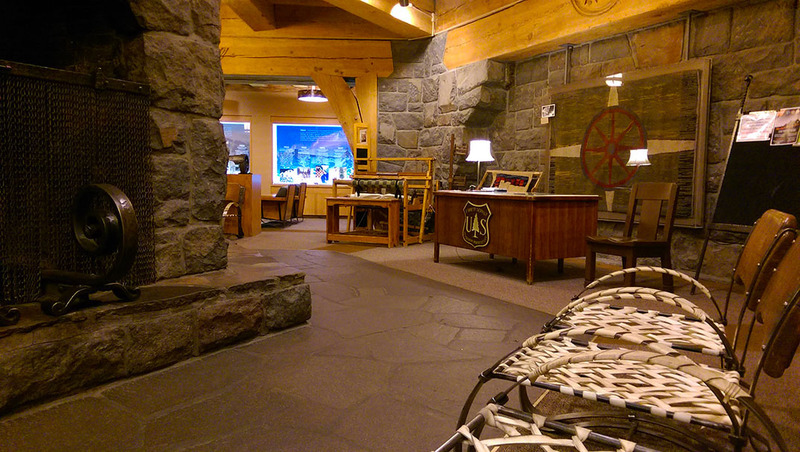 It’s Timberline Lodge: a WPA-built resort on the south face of Mt. Hood in Oregon, about ninety minutes east of Portland. 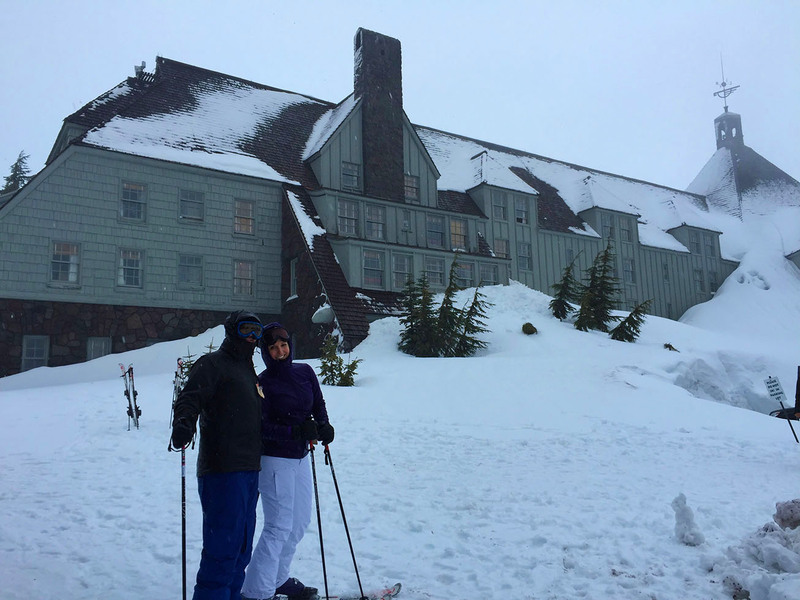 As far as Rogue Trip is concerned, this is a bit of a cheat, as we actually spent time at Timberline a few months prior to starting our trip. In fact, it was a Valentine’s Day weekend ski trip with Hailey’s fam dragging Mitch along to mock him as he repeatedly fell down the bunny slope. 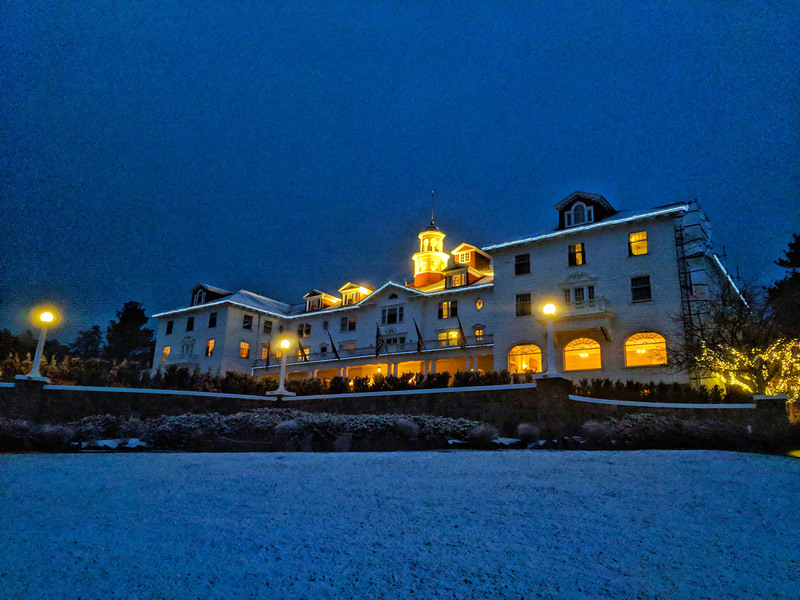 Nevertheless, it’s something we’ve got under our belts, and given the weather at the time, it was just as eerily reminiscent of The Shining as our Ahwahnee Hotel experience. Here’s us posing in front of the very much snowed-in hotel. We were out on the slopes well into the night, at which point we were one of only a few folks left on the mountain. Combine that with the blizzard conditions, and you get a near-perfect remake of the legendary “Here’s Johnny!” scene wherein Danny escapes down a snowbank from the bathroom his mom is still stuck in. 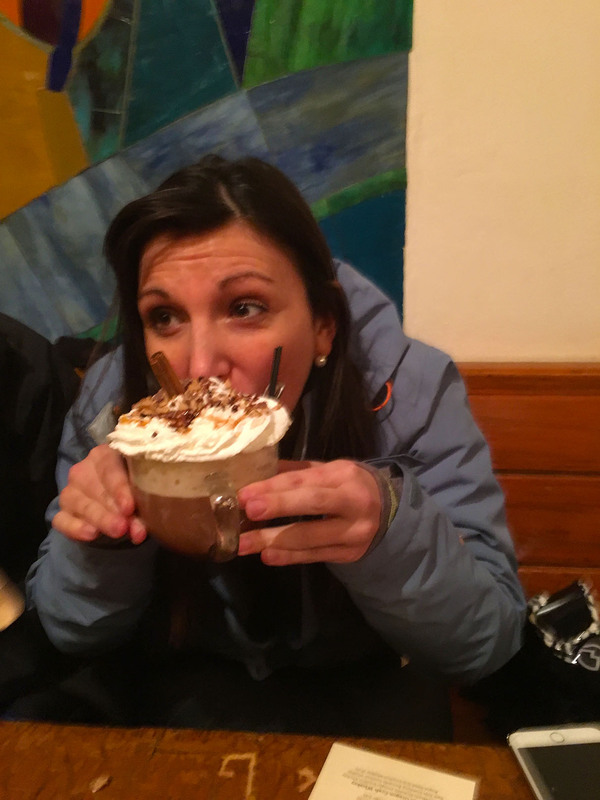 Bonus: their hot chocolates are insanely large and rewarding. If we haven’t stripped all the movie magic from The Shining yet, this last stop should do the trick. You know the opening scene, where the family’s little yellow VW Beetle is trudging its way up an unbelievably grand mountain road? 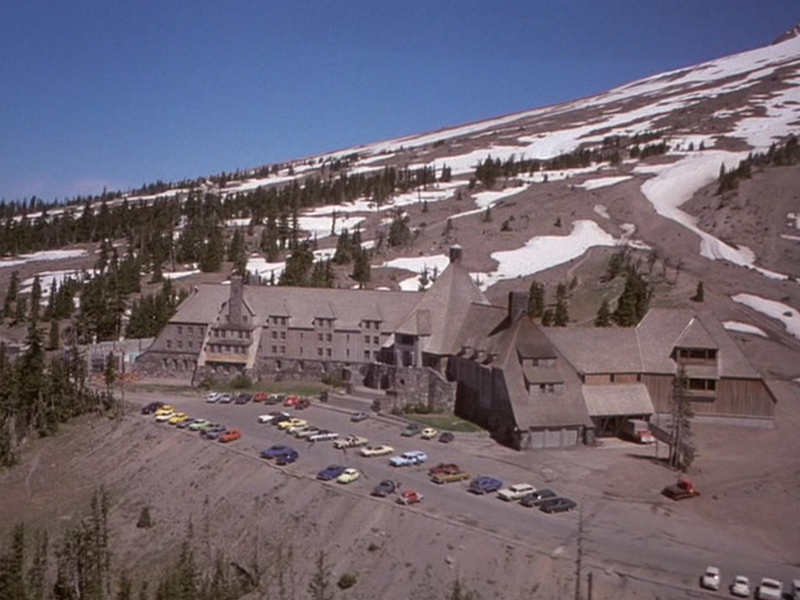 It must be the road to Timberline Lodge since that’s where the opening scene ends, right? Nope. The road in question is actually three states over, near the Canadian border in Montana. Its name? 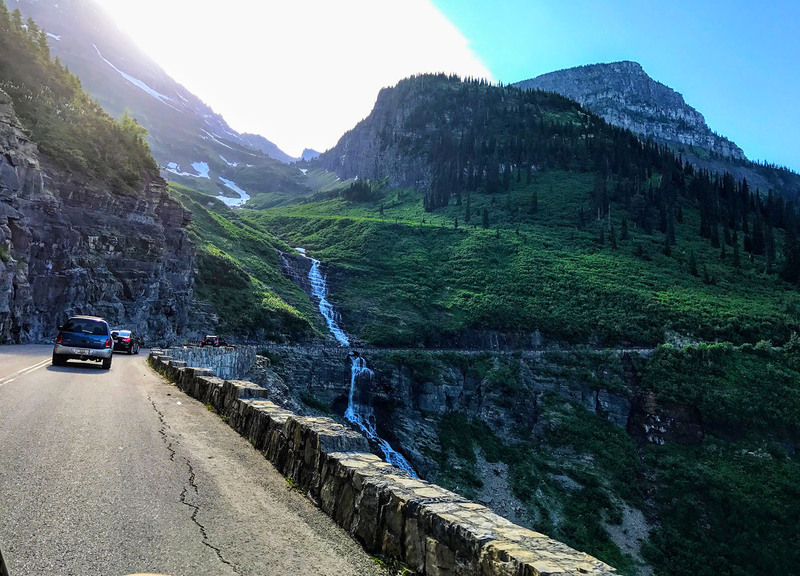 Going-To-The-Sun Road. 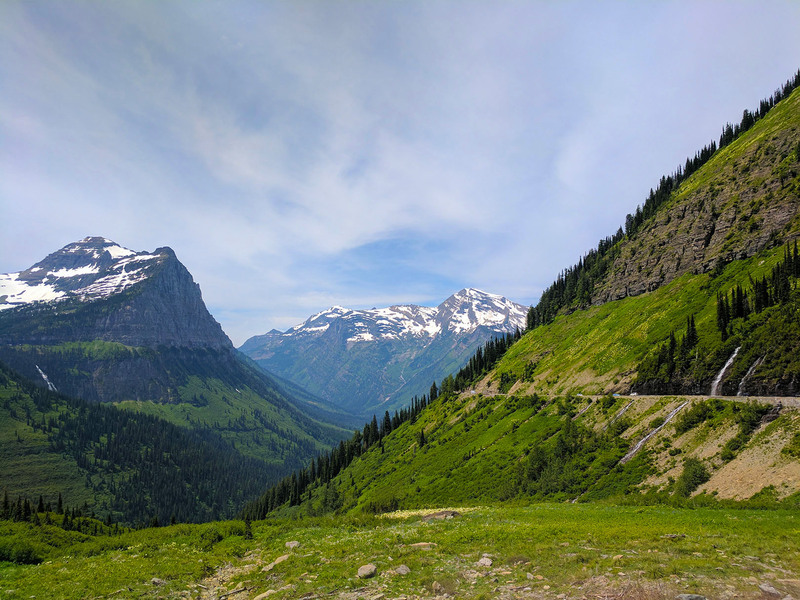 This is your main artery through Glacier National Park, which explains the mesmerizing scenery. Rogue Trip passed through here on the 4th of July, when greenery was much more abundant. Still, the parallels should be obvious. 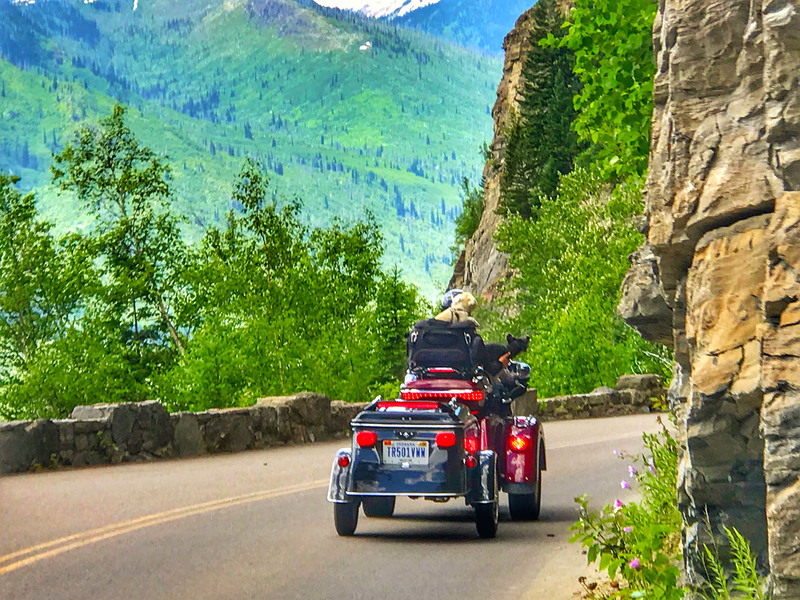 These puppies on a motorcycle ain’t scared. 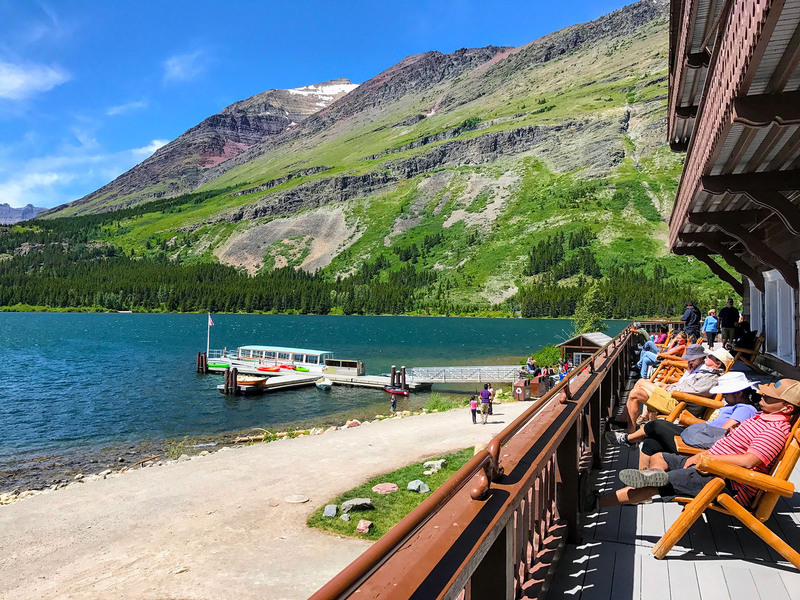 Strangely enough, there’s an amazing lodge just up the road in this national park, known as Many Glacier Hotel. Seems like it would’ve been sensible and appropriate to have shot the movie here, or at least kept the location theme going. But hey, when you’re Stanley Kubrick in 1980, you can make things as difficult as you want. Don’t these hotel guests look frightening enough? 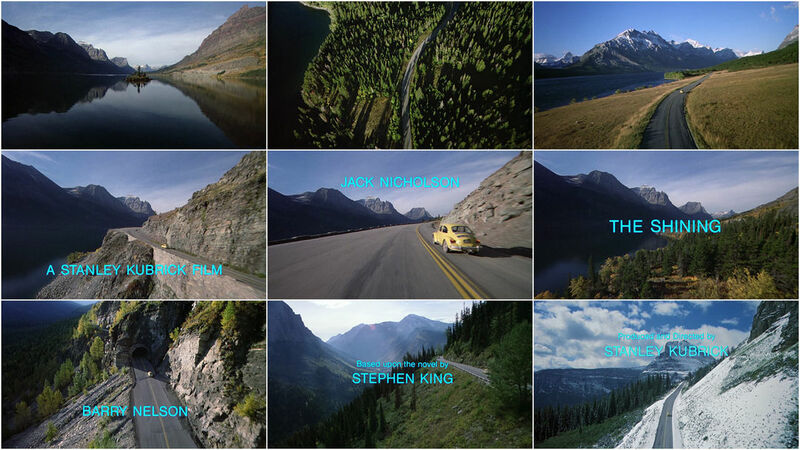 Four stops, and all the Shining references you can handle. Google Maps says the most direct route for this special Rogue Trip stage will take you 58 hours and 3,600 miles. 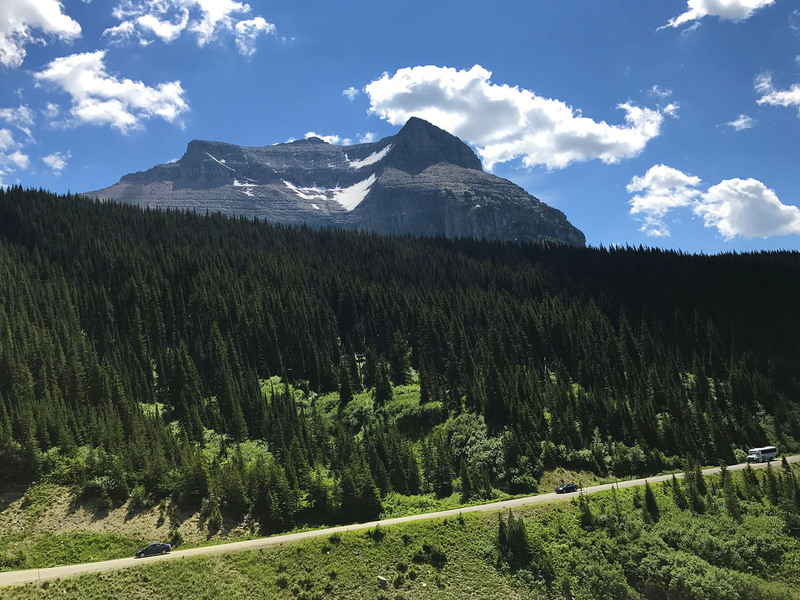 While we wouldn’t recommend that grueling path specifically, every one of these stops is worthy of a visit — even if you have no taste in movies. 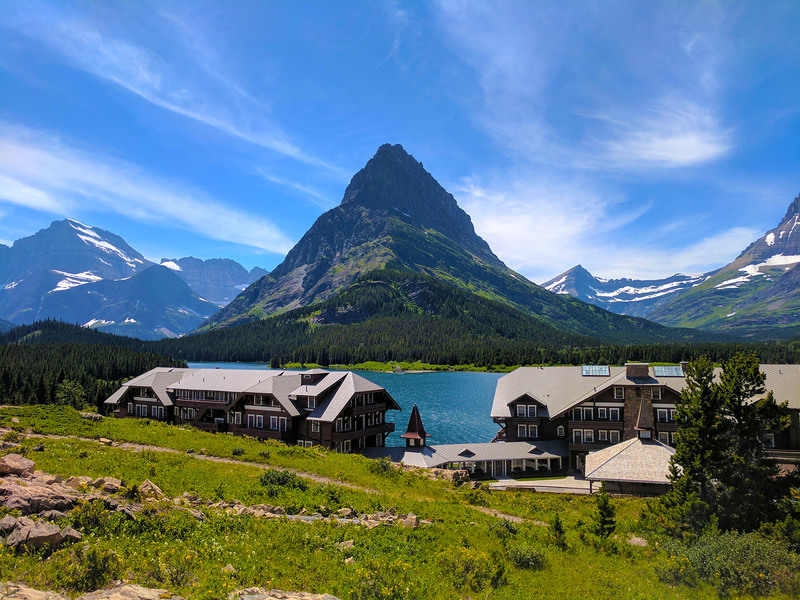 Some of America’s greatest natural wonders can be found on location here, which in and of itself is more than a coincidence Kubrick wanted to bring home as a subliminal message. Or whatever, you could go out into your yard and prune the bushes to look like dinosaurs so Stephen King can die happy. Grab all the locations via our custom Google Maps List here.